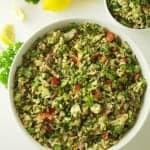 I first became acquainted with tabbouleh salad in the early 1970’s when we received our bi-monthly Time Life Foods of the World cookbook on Middle Eastern Cooking. 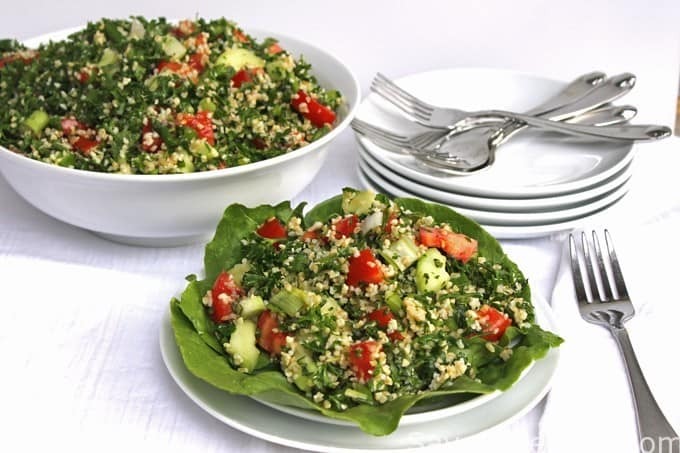 Tabbouleh originated in Turkey and migrated to the entire Middle Eastern countries. I would say it is probably all over the world now. 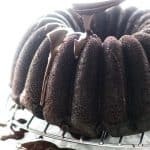 It’s that good! 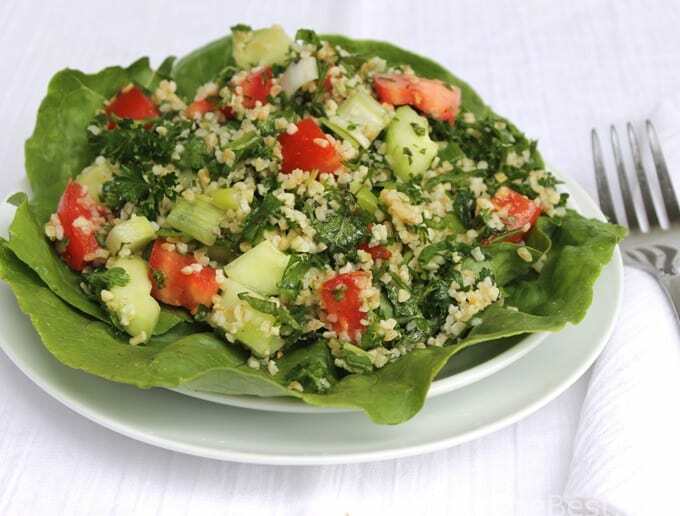 The main ingredient in tabbouleh is bulgur, which is a whole-wheat grain that has been cracked and ground fine. Bulgur is high fiber, low-fat and low-calorie. 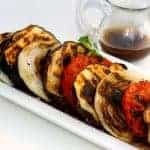 With the addition of fresh vegetables, herbs and a lemon vinaigrette it is a filling and satisfying dish that is both healthy, nutritious and delicious. 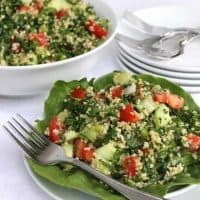 Tabbouleh was a family favorite when our kids were growing up and I always had to make a large batch of it so there would be leftovers. 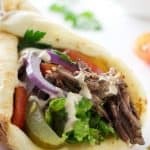 I guess that has not changed as when I told Dahn I was going to make tabbouleh and do a post on it she asked me to make a big batch so she could have some. 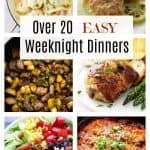 Personally, I think the curly-leaf parsley works better in this recipe as it is sturdier and holds up much better than the flat-leaf parsley, also, I really like cucumber in my tabbouleh and have included it in this recipe which I have adapted from my Time Life cookbook. 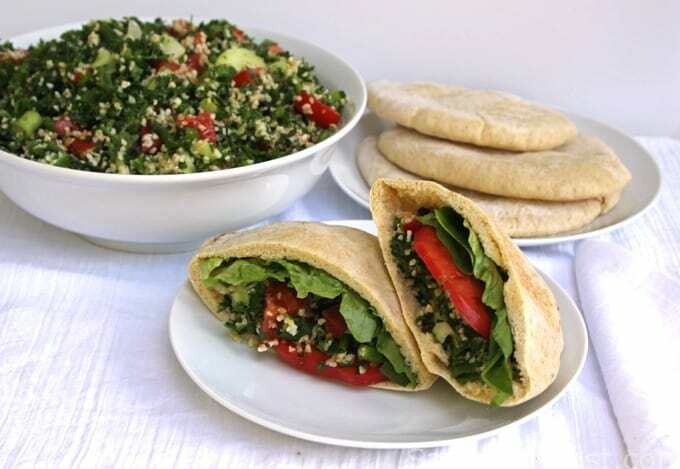 Tabbouleh also makes a terrific sandwich by stuffing it into a pita bread pocket along with a slice of tomato and crisp romaine lettuce. Tabbouleh is a low-calorie, low-fat salad with bulgur as the main ingredient with vegetables of parsley, mint, tomatoes and cucumber. 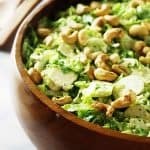 This is a healthy, nutritious salad. 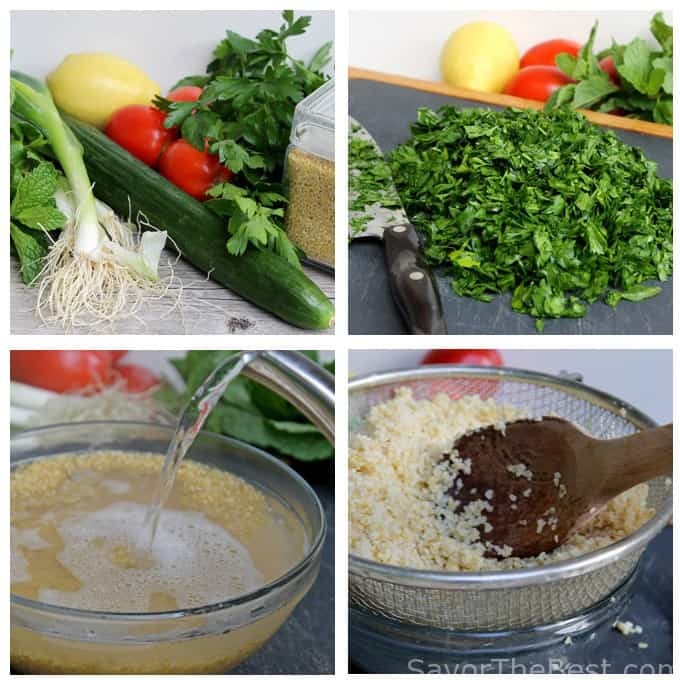 Place the bulgur in a bowl and pour in enough boiling water to cover it completely. Let the bulgur soak for 5 minutes, then drain through a sieve, pressing down and then fluffing with a fork to get as much of the moisture drained out as possible. Reserve and allow to cool completely. 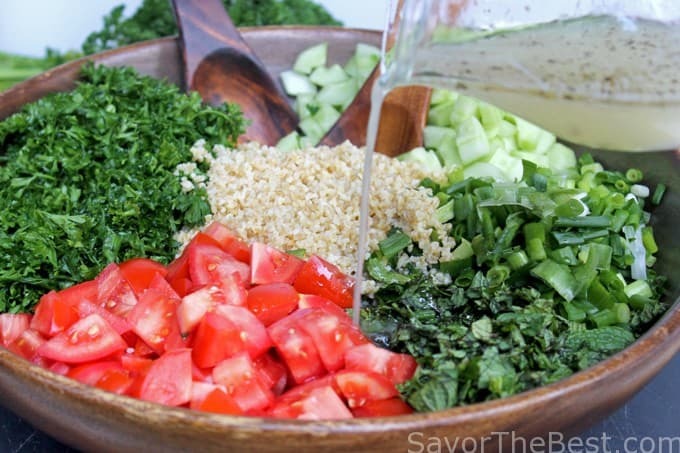 Add the cooled bulgur to a large shallow bowl and add the mint, parsley, onions, tomatoes and cucumber. 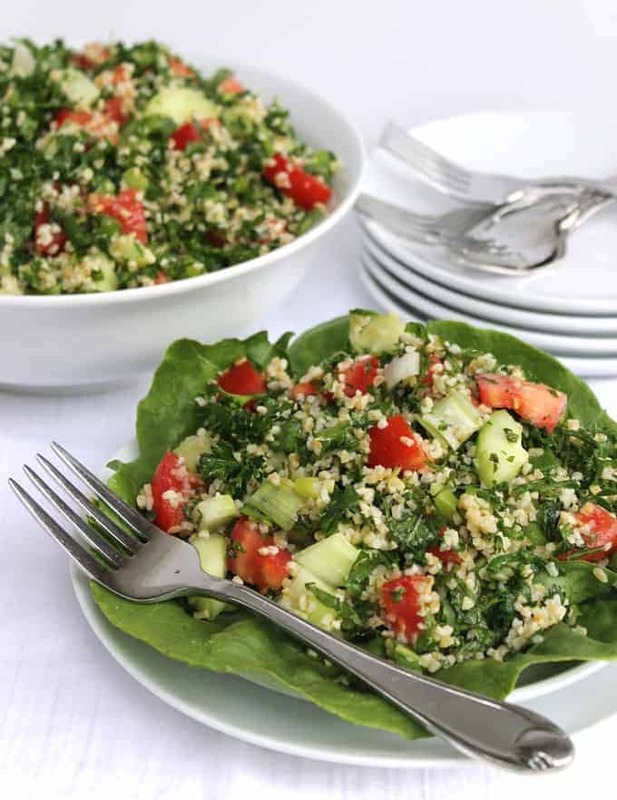 Tabbouleh is a great make-ahead salad for a planned event. 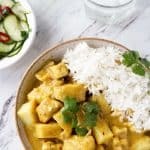 Prepare the ingredients in separate covered containers and when ready to serve, add to a large serving bowl, toss with vinaigrette, allow to sit a few minutes for the flavors to meld before serving.